I’m in a meeting | Where to next? I’ve wanted to post this photo for ages, but it has taken me all those ‘ages’ to discover that it is actually called a ‘conference’ bike. 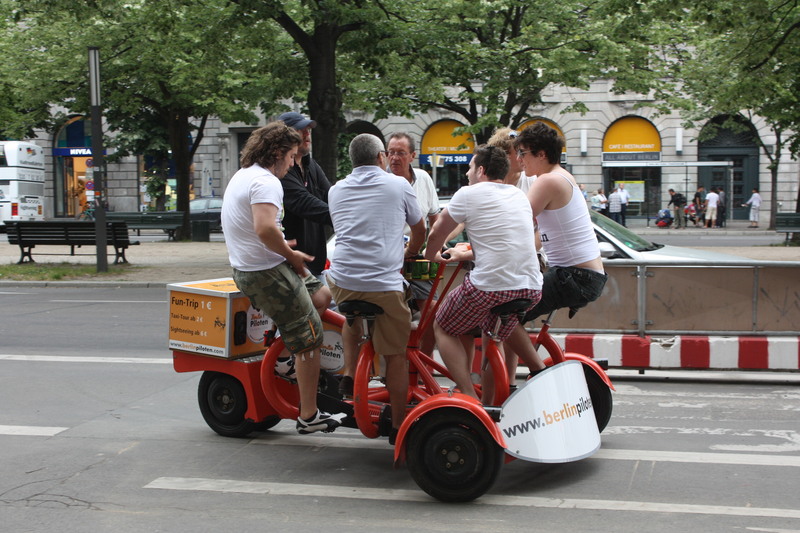 It’s round, seats seven (including the main operator) and is very popular in the tourist areas of Berlin. Everyone sits around the little conference table in the middle and pedals like mad. The pleasure of attending this meeting costs a euro per person, and I assume that is for some defined period of time—such as 15 minutes. Conference bikes (also called team bikes) seem to be very popular all over the city, and are really meant to have full attendance. You should see the main operator struggle to pedal when no one else is on board. Poor John reckons it must be a part-time job for soccer players who want to keep their calves in shape. There’s more detail at http://www.conferencebike-berlin.de/8.html and there are a few video clips on YouTube. Just search for conference bike. I’ll buy one of this one day!